So after all, you see just the performance of my copies of these lenses. Those who know me will agree that I am very picky about my lenses so expect my copies to be rather better than worse. Nevertheless, there will be samples that could perform differently. This also applies for every other review on the web but is especially true for a comparison of three zoom lenses. 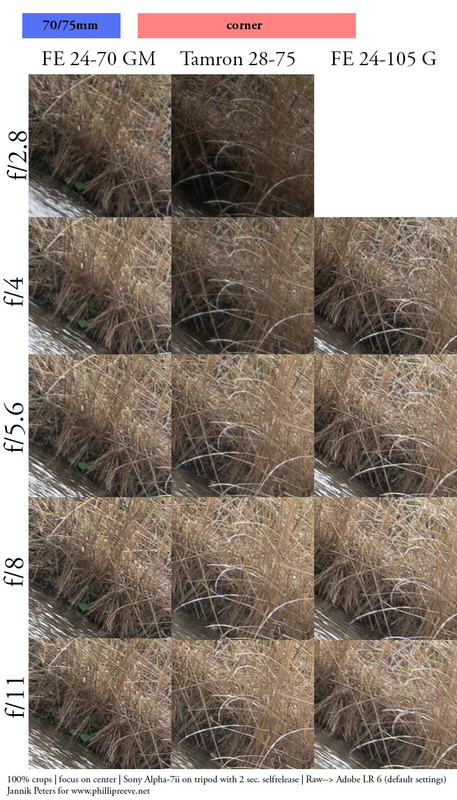 This article is obviously very geeky as it compares the sharpness around the infinity mark in detail at different focal lengths and areas of the frame. That’s why I will start with the..
For those who don’t want to look at all images in detail, I’ve created this table. I’ve rated the lenses in all analyzed categories. 1 stands for the best performer, 3 for the weakest. It’s easily visible that my copy of the 2.8/24-70 GM lens stands out of the crowd in terms of sharpness. Especially at the long end, it resolves generally a bit more detail than the rest. 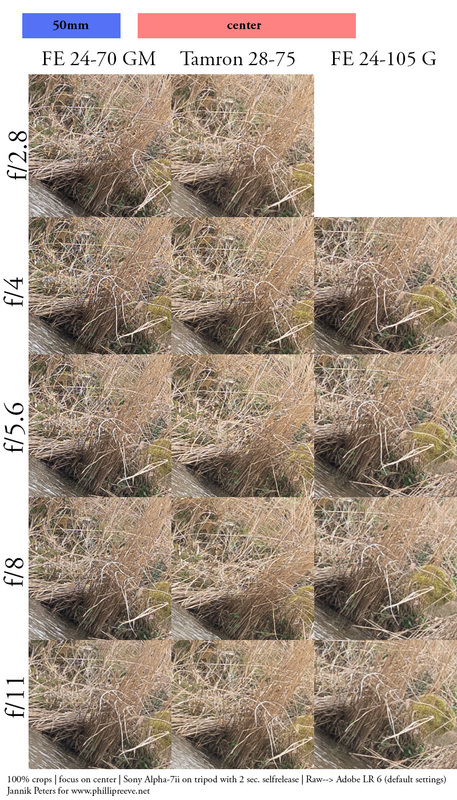 The weaknesses of the GM are a mid zone dip at 24mm and a slightly worse performance at 35mm. This behavior also matches with another copy of this lens that I have tested a while ago. This said, the other lenses are no slouches at all. 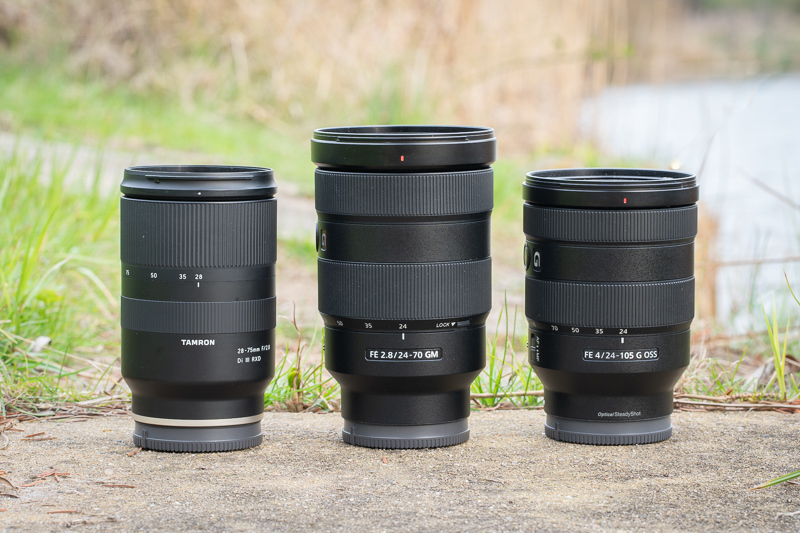 Generally, the Tamron 2.8/28-75 is a bit sharper than the Sony 4/24-105 in the center while the latter is more constant across the frame which fits also well to their applications. Interestingly, the Tamron renders a bit warmer than both Sony lenses which have roughly the same color/contrast footprint. In my opinion, we see three very good performances and none of these lenses should be ruled out just by this shootout. The other categories of performance (especially bokeh) and the general specs of the lenses can be very important for a buying decision and will be discussed in the next articles. Midframe: The Tamron 2.8/28-75 and the Sony 4/24-105 are very good at apertures below f/8, the GM lacks in contrast at these apertures. At f/8, all lenses are almost equal. 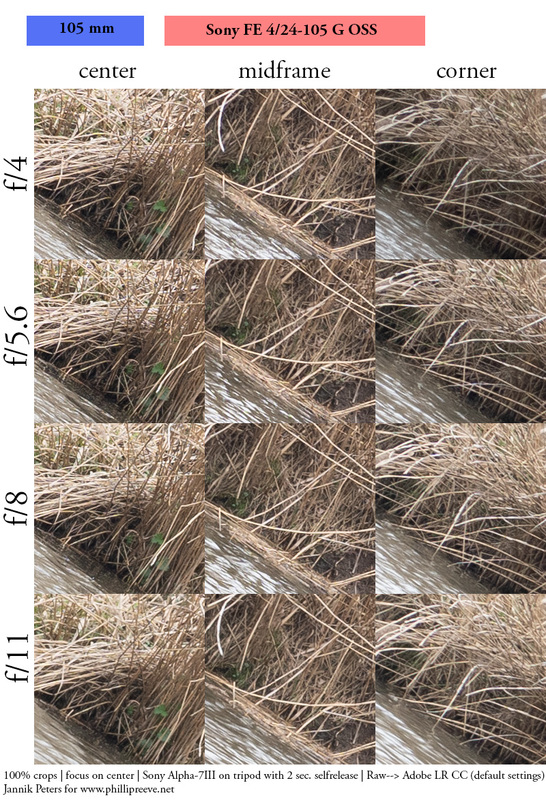 Corner: The Sony 2.8/24-70 GM resolves more details than the other two lenses at all apertures. The other two lenses are very close and also not bad at all. Center: The Sony 2.8/24-70 GM is razor sharp here, there is even a tad of diffraction visible at f/5.6. The Tamron 2.8/28-75 is also very good in the center, the biggest difference to the GM is visible at f/2.8. The Sony 4/24-105 is also very good but lacks a bit in edge acuity compared to the other two. Corner: The Tamrom 2.8/28-75 shows high astigmatism wide open but resolves more detail at smaller apertures while the Sony 4/24-105 is much better at larger apertures. The Sony 2.8/24-70 GM is once more clearly the best and excellent at f/8. Bonus: 105mm: This is what makes the Sony 4/24-105 G stand out of the crowd. The central performance is already good wide open and best at f/5.6. 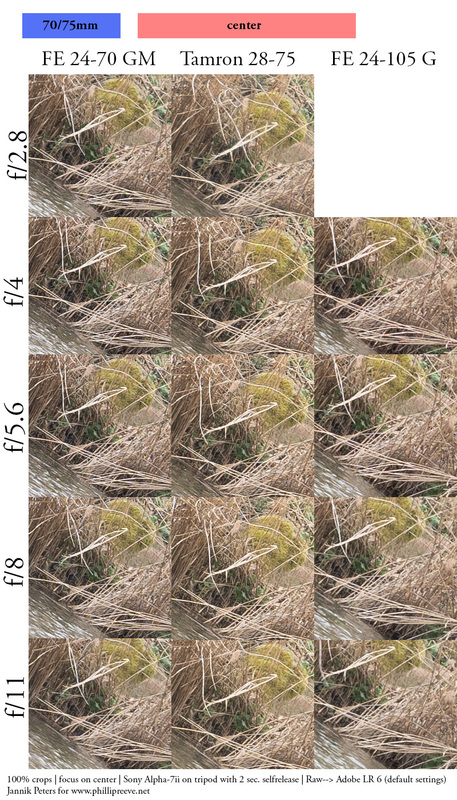 Midframe and corner are sharpest at f/8, the image is good across the frame there. Part 2 (bokeh) will follow! PS: Comparing the long end of these lenses with the 85mm f1.8, for portraits usage, would be phenomenal! I am also looking forward to continue this shootout. Maybe the GM 1.8/135 will come between a soon continuation of the series but I will try my best. I can compare it to my 1.8/85 once I setup a portrait scenario. Unfortunately in my country the 24-105G is 2 times (actually a bit more) more expensive than Tamron 28-75. Which makes it a bit less reasonable choice than in US or EU markets. Tamron interesting but he doesn’t need me in the trip 24mm and I don’t need aperture. It would be interesting to see a comparison with Canon EF zooms that can be put on a Sony through an adapter. He purchased the EF 24-105 STM, but I have no way to test with other zoom lenses. thanks alot for your effort, i greatly appreciate it, as comparisons are hard work and alot less enjoyable. lot of copy variation on the lenses though. i have two sony 24 105 and there is visible variation (center and corners) between the two. you can test 3 copies of the lens and it will look like 3 different lenses. Same goes with the sony 24 70. Don’t know if also the Tamrons have such a variation. This is just amazing zoom shootout i really liked it…thanks you so much for sharing! Thank you for the tests. For me it validates the idea that the Tamron is a tremendously good value. I see it as very competitive in these images despite being far cheaper and lighter than the Sony. The differences you document really aren’t that big to me as someone who doesn’t pixel peep much. 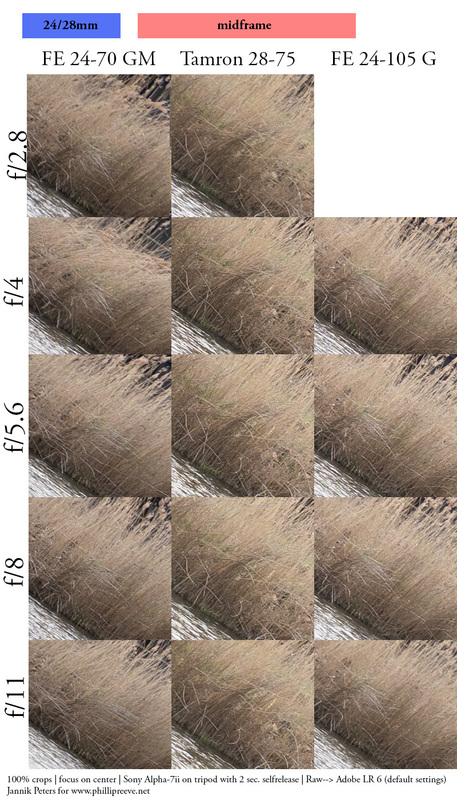 Personally I think many photographers now put too much weight on 100% crops of high resolution images. I think the search for pixel peeping perfection is part of the reason why we have ever heavier and more expensive lenses and for me at least, small sharpness differences between good lenses, don’t make that much of a difference when it comes to whether or not an image is good. Things like rendering, light, composition, subject matter, talent, etc make much more of a difference. To be honest I don’t really find work from today on today’s ultra high resolution cameras with the best of modern lenses any more compelling than what the best photographers were putting out ten years ago. Yes things may be sharper, noise may be lower, you might be able to make a better gigantic print or heavy crop etc but in terms of whether or not the image is impactful to me, I really don’t find the work today to be any more impressive than what great photographers were doing a decade ago. 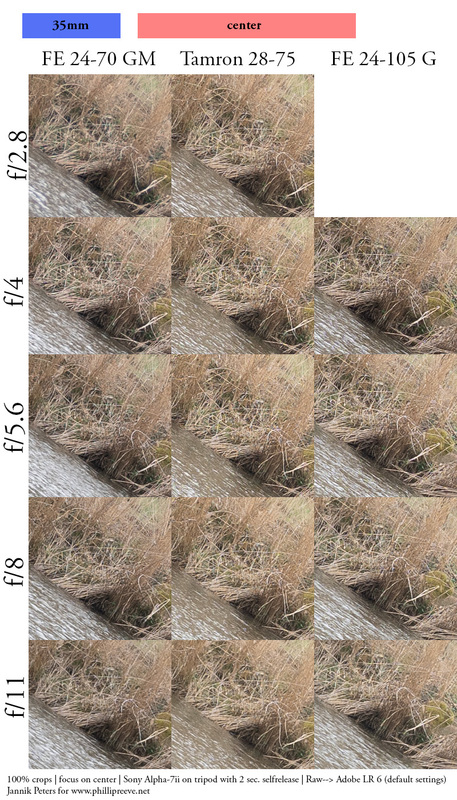 I doubt that I’ll be more impressed by what people will be doing with 100mp sensors. Sure the images may technically be better but I don’t think they will necessarily be any more compelling in most cases. I agree with your column a few months ago wanting more smaller, slower, and/or less perfect lenses. im looking forward to the bokeh test, i’m wondering what part 3 will be about, handling/buildquality? Very interesting test, thanks a lot 🙂 My personal expericence is totally different here. I compared the SEL2470GM and the SEL24105G – and the G was sharper outside Center, and Shows very goog sharpness in the whole zoom range; so I decided to buy the G, which was little decentered, but Schuhmann (Herr Mayr) could fix it. Who is Schumann..? I would like to have mine centered too. Sony Service center in Austria. This doesn’t match my findings, I had the GM, but sold it when I got the 24-105 as it was sharper in most areas, especially at 70mm where the 24-105 was miles ahead of the GM. G 24 105 are so different that in some aspects they almost look like two different lenses. I think one issue is the RAW conversion can treat different lenses differently. It seems to me that it is just applying less sharpening to the 24-105 across the board. 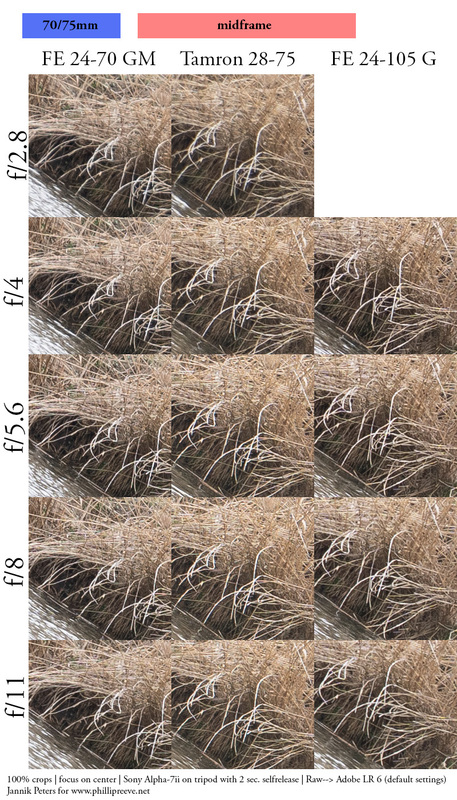 Compare the images at f/11, for example, where lens differences should be almost zero. Definitely interesting, I noticed that too. 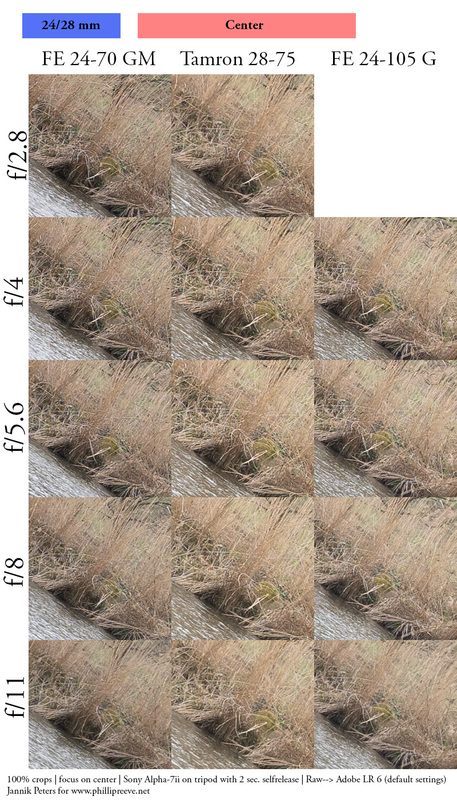 But I think my methodology isn’t wrong as this is what the user will face (at least in Lightroom). Maybe the lenses diffract differently as well although I don’t know to which level this is possible. They said it was part one of their test. Since all these lenses are of similar caliber mostly, won’t it be a good idea to benchmark them against a supposedly weak lens like 28-70 kit lens. That will tell me that at F8, where and what exactly a buyer is getting. Normally the benchmarking is done against the “best”. The overall and the sharpness scores of 24-70 GM vs FE 28-70 on a7R2 are, 33 vs 28 and 28 vs 25. So basically you are paying for build (and size !) bokeh and Fstop and yes wide open sharpness. 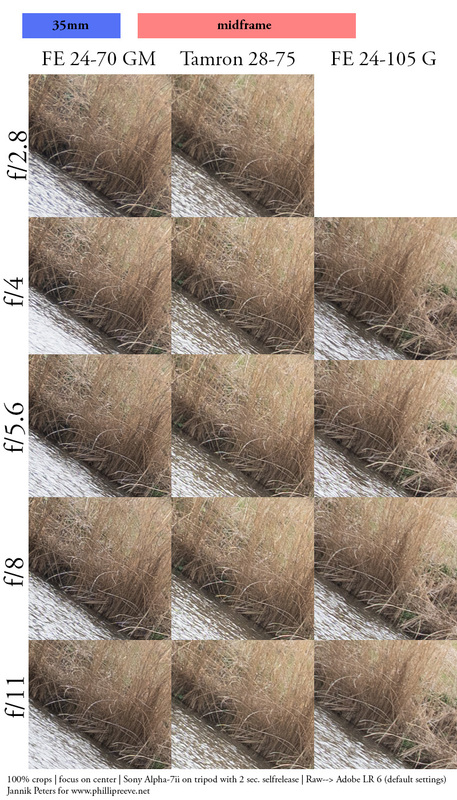 Sharpness at F8 won’t be a day and night difference. I love the Tamron. The price vs performance is unbeatable. I used my uncle’s 16-35GM for a good while before i bought the Tamron, and I saw nothing about it to justify the significant extra cost. Interesting comparison. I don’t know if you have experience with the Contax Yashica Vario-Sonnar T* 3.4/35-70 stadardish zoom? It would be interesting to get a sense of how far optics, coatings and ergonomics have cone since 1982, when that standard zoom was designed. The Contax zoom has quite a cult following, much like the Vario-Sonnar T* 4.5-5.6/100-300 that you reviewed recently, and many still swear by it and dare compare it to current standard zooms. These comparisons are certainly a bit forced, but they raise the interesting question of how much better todays 24-70s are. I would second this request. I have used the Contax 35-70 happily for many years (since the film era). But it would be good to have AF and EXIF info sometimes — as well as easier coupling with the Sony image stabilizer system. Are these worth the extra cost — maybe not quite yet. But your input might tip the scales for me (at least vs a vs the Tamron — which is attractive to me from a size/weight/price perspective). I owned and used the CY 35-70 for a good while. Despite of that, the CY 35-70 is a very good lens and could hold up well in that comparison at 50mm and 70mm. It just feels dated, especially with the more advanced Sony bodies. I was actually happy to sell it for the Tamron which got much more use in real life than the Contax. There is not only sharpness in life. Not only my 28/70 has sharpness problems in the low range , it has clearly a mediocre performance in term of contrast and colours. Its rendition can be qualified as muted compared for example with the 24/70 f4. Thanks for your detailed answer, Jannik. You are of course right about AF, EXIF data, having to manually dial in FL for IBIS, the push-pull zoom mechanism. For me, personally, the autofocus adds no value and I have been able to shoot with it at the same keeper rate as my more recent MF lenses – like Loxias and CV lenses – without critical need for IBIS. 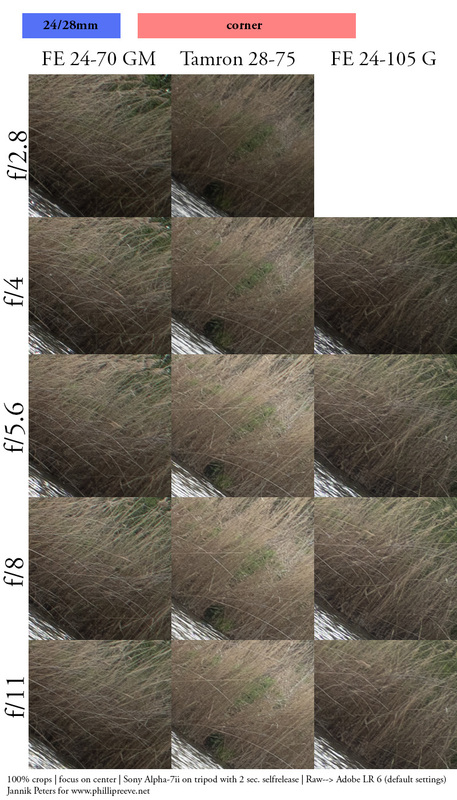 I could complain about EXIF data, but it doesn’t affect image quality. The push-pull mechanism is perhaps the most difficult aspect to justify and get used to, especially with no FL data in the EVF. Where I don’t agree, though, is regarding the pronounced field curvature at 35mm. This is of course not uncommon in other Zeiss 35mm lenses, but I believe the C/Y 35-70 is by far not the worst offender in this respect. I agree that image quality, despite some shortcomings compared to more recent glass, holds up very well. My experience, having only owned the a7RIII, is that it gives great results on the Sony 42mpx sensor, but I have not much to compare it with. I sold my 16-35 GM, which is better than its reputation at 35mm, and I don’t miss it. The user experience is certainly not the most enjoyable, though. Long and heavy adapter, push-pull zooming are not great. The “makro” feature is what feels most dated, but I really appreciate the generous focus throw. I wonder how the 35-70 formula would perform with new coatings and zoom ring. Wishful thinking, lol. Thanks for sharing your test results, Jannik. I can feel the pain and patience behind the results. I have both the Tamron 28-75 and the Sony 24015/4. Both are excellent lenses. I previously owned the Sony 24-70GM as well. While that lens is outstanding, it’s size and weight made me change initially to the 24-105/4. What intrigued me to buy the Tamron is its close focusing distance. However, while faster than the Sony, I sometimes miss the reach of the 24-105mm. As Jannik says, these are all excellent lenses and owning anyone of these lenses will make the owner happy.